JINMO's 105th album "Incarnatio" has released from Avant-attaque. A long-waited JINMO's Christmas album in 2011, grand Christmas album over 80 minutes which had been composed since this spring, "Incarnatio" is now available in Avant-attaque music ! and "I'm praying" for Christmas in 2010. JINMO had released Christmas albums every year since 2007. For this year, it has composed translunary and futuristic guitar orchestration in the main. Of course, you will hear the sound of church bells you've heard every Christmas. The title "Incarnatio" is for "incarnation" in Latin. Refer to Wikipedia, the Incarnation of Christ is a central Christian doctrine that God became flesh, assumed a human nature, and became a man in the form of Jesus Christ, the Son of God and the second person of the Trinity. JINMO says "It is practice of an allot from transcendental thing to humans, and it is still ongoing." 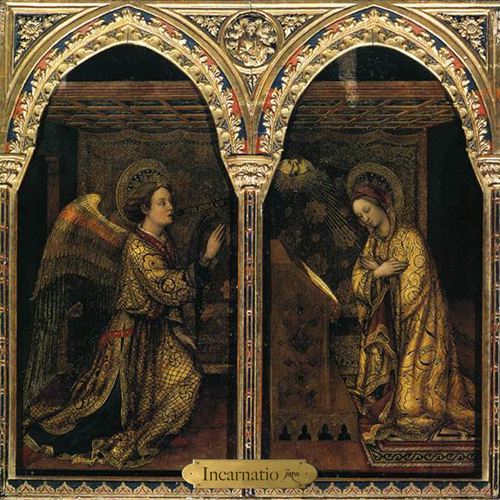 Cover picture is "Annunciation" by Jacopo Bellini in Early Renaissance ( in 1444). It depicts the scene of Annunciation. Symphonic guitar orchestration is pleasantly sacred drone, and it also has beautiful ultrasound part intensely. Listening through the first to the last, it begins with infinite falling, and it ends with an infinite rising... it remind us the Incarnate which came down to earth and go back to heaven. The more listen, closer to heaven. Every track fills your soul with joy and love. experimental music but also recommend to Guitar Manias.